By road or air Lazareth LMV 496 La Moto Volante (The Flying Motorcycle) will get you there. The Lazareth company is renowned for building enviable motorbikes. However, the LMV 496 La Moto Volante, which is “the flying motorcycle” in French, is more than just a motorbike. It’s a daring attempt to defy the odds and reach for the skies, perhaps literally. It’s basically an upgrade of the Maserati V8-powered four-wheeled beast released some years ago, but it’s an upgrade that has unlimited possibilities. If you’ve ever been stuck in traffic even while riding your bike, you’d know the world is in dire need of a flying motorbike. The most exciting feature of the LMV 496 is the 96,000 rpm JetCat jet turbine installed in each of the bike’s 4 wheel hubs. The turbine acts to propel the motorbike into the sky when the flying mode is activated. The activation involves pressing a simple switch on your bike’s dashboard. When this mode is activated, the wheel slowly moves into a horizontal orientation as the motorbike is propelled into the air. The prototype videos released show that the bike can currently only hover a few feet above ground level. The LMV 496 shares a striking resemblance with the LM847. The motorbike is equipped with a kerosene tank that is expertly concealed by a composite body. The kerosene tank supplies enough fuel to power about 10 minutes of flight. While in flight, the dashboard displays essential flight information such as speed, position, altitude, etc. The handling and driving position are imitations of earlier models of Lazareth vehicles. As to whether the motorbike can really fly, it remains to be seen. However, the demo video does show that the technology is undeniably here. 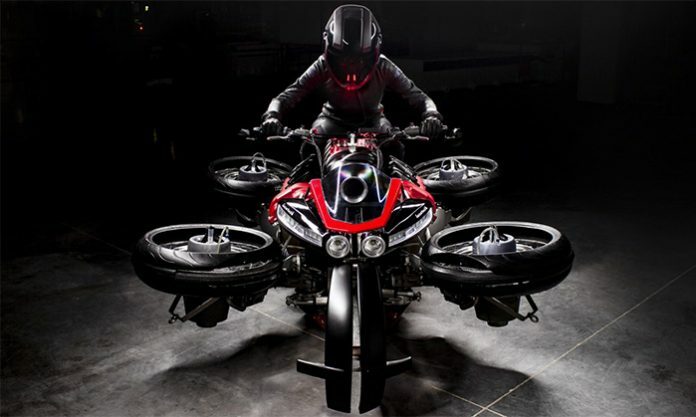 The test run publicized by the manufacturing company showed the bike hovering at about 3.3 feet above a platform. At the moment, there is no completely functional version of the LMV 496. Information from New Atlas reveals that the Lazareth company would start accepting preorders of the motorbike around October 2019. Unsurprisingly, the bike would not come cheap. The pre-orders could go for as much as $560,000. The Lazareth LMV 496 is not the first flying motorcycle concept we have seen. Earlier, we reported on another such concept called The Speeder by Jetpack Aviation, a California startup. Lazareth needs to fine tune their machine and turn it into the vehicle that people have been seeking for decades. Then there is the matter of making it affordable and legal for widespread use.